With the general election looming in November, Democrat Hillary Clinton and Republican Donald Trump, the presumed nominees, are turning their attention to independent voters who may determine the outcome of the hotly contested presidential race. Although not a hot button issue like immigration or trade policy, Clinton’s plan to alleviate the financial stress of caregiving—whether for a child or other family member—may be an important wedge issue to attract independent voters, especially women. The subject gained attention last week when a research center in Berkeley, California, released a negative assessment of employment conditions and practices among early childhood workers, a predominantly female workforce. Clinton is proposing a 3-pronged plan to alleviate the financial stress of caregiving: tax credits to help offset up to $6,000 in annual caregiving costs for elderly family members; providing credits towards monthly Social Security retirement benefits for caregivers who leave the paid labor force to care for elderly relatives; and expanding state-level grants to improve respite care access for family caregivers of children or adults of any age. So far, Trump has not said much above caregiving, beyond backing on-site child care by employers. “It’s not expensive for a company to do it,” he has said. This entry was posted in In The News on July 14, 2016 by waworkfam. The central conflict of domestic life right now isn’t men versus women or mothers versus fathers; it’s the family against money. The solution to the work-life conundrum is not “enlisting men” in the domestic sphere. The solution is establishing social supports that allow families to function. The fact is, men can’t have it all, for the same reason women can’t: whether or not the load is being shared 50-50 doesn’t matter if the load is still unbearable. It will not become bearable once women lean in, or once the consciousness is raised, or once men are full partners, always, in domestic life. It will become bearable when decidedly more quotidian things become commonplace—like paid parental leave and affordable, quality day care. This entry was posted in In The News, Paid Family Leave, Paid Sick Days on July 11, 2016 by waworkfam. [Original: UPI] For each additional month a woman has paid maternity leave, infant mortality decreases by more than 10 percent, according to a new study of births in 20 countries. Researchers at McGill University and the University of California Los Angeles found paid maternity leave has a significant impact on infant mortality in low- and high-income countries, echoing previous research that has shown the same. Paid maternity leave reduces stress, increases the chances for breastfeeding and other infant care, and allows a mother to seek more medical attention for herself after having a baby. Although 188 countries have guaranteed paid leave for new mothers, though how much varies greatly from country to country — in Canada and some European countries, women get one year of paid time off, while countries such as Papua New Guinea, Suriname and the United States have no guaranteed paid maternity leave. This entry was posted in In The News, Paid Family Leave on April 5, 2016 by waworkfam. “If regulation of the powerful goes up, jobs will be lost. In short, don’t push it, buddy. Giving away free stuff is very easy for politicians to do, but the simplest rule of economics is TANSTAAFL — there ain’t no such thing as a free lunch. Anything a politician gives you, he must first take from you. And so if you have the federal government mandate paid medical leave,what that ends up doing is driving up the cost of labor for low-income workers. Do you see how slimy this strategy is? Do you see how strong-handed this approach is? Do you see how they are striking fear and doubt into the minds of American workers? And this isn’t anything new. This is how Republicans and businesses have been framing workplace benefits for a very long time. They’ve perpetually tried to scare the American worker by threatening to cut their jobs if they ever asked for too much. (What they define as “too much” has been ever-changing. Forty years ago occupational health and safety fit under such a category, today it’s paid leave, tomorrow it may be vacation time.) In economically anxious times they know this intimidation tactic often works. Why take a chance and try to push for better benefits if your job is already in the balance? Evidence from the first two states shows that [paid family leave programs] haven’t hurt employers. About 90 percent of California businesses say that it either had a positive impact or none on profitability, employee performance, and productivity, while it helped reduce turnover, saving them an estimated $89 million each year. Themajority of New Jersey businesses surveyed also said that it hasn’t hurt their finances and some saw a benefit. The job-killing dystopia which Ted Cruz foreshadowed to the mother of four is simply a trick. Thankfully, we know why politicians like Cruz are continuing to sell this scam to the American worker: because if he can get workers to believe this scary tale, big businesses and their politicians win. This entry was posted in Equal Pay, In The News, Paid Family Leave, Paid Sick Days on January 20, 2016 by waworkfam. Congratulations on paid sick and safe leave, Spokane! On January 11, 2016, the Spokane City Council passed an ordinance assuring most people working in the city the right to earn paid sick and safe leave starting next year. The Council voted 6 to 1 for the ordinance. At the start of Monday evening’s 5 ½ hour long council meeting, the policy on the table provided for only three days of paid sick time. After listening to testimony from over 50 people – the overwhelming majority of them favoring a universal policy of at least five days, the Council amended the proposal. The ordinance as passed allows workers to earn an hour of sick leave for every 30 hours worked, up to 5 days in companies with 10 or more employees, and up to 3 days in smaller firms. Paid leave can be used for the health needs of the worker or a family member, bereavement, and to deal with the consequences of domestic violence or sexual assault. 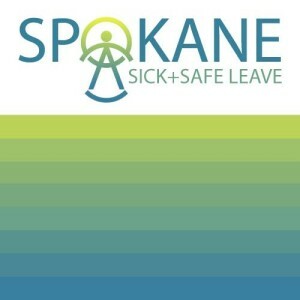 The Spokane Alliance led the Earned Sick and Safe Time Spokane Coalition in a remarkable two-year organizing effort that included a listening tour with over 50 small businesses and nonprofits, multiple community forums, and collecting stories of impacted workers. They coordinated testimony and turnout at hearings and events, submission of letters to the editor and op-eds, and the delivery of over 1,000 public comments to Council members. Spokane is the first jurisdiction in 2016 to pass a paid sick days law. In 2015, Tacoma was first out of the gate. Four states and more than 20 U.S. cities, including Seattle, SeaTac, and Portland, now have sick leave laws in place. This entry was posted in In The News, Paid Sick Days and tagged paid sick leave, Spokane on January 15, 2016 by waworkfam.